Mike Epps Brings Kangaroo On Stage , He Responds !! BHR Hollywood Reports.......The actor, who appeared in “The Hangover” and “Next Friday,” brought the kangaroo on stage during his show in Detroit on Friday and appeared to egg the animal on, pulling it by its leash. Some show goers and Epps followers were not pleased with the animal addition to the show. Epps promised to donate to vegan charity Viva! 's campaign to save the kangaroo and shared a message of apology on his Instagram account after receiving backlash for video of the kangaroo appearing onstage. "Look I want to sincerely apologize to everybody, I don't own the kangaroo and did not mean any harm to the animal it got out of hand and I am sorry," Epps wrote. "Sorry if I offended anybody I love animals since I was a kid I had dogs my whole life!" 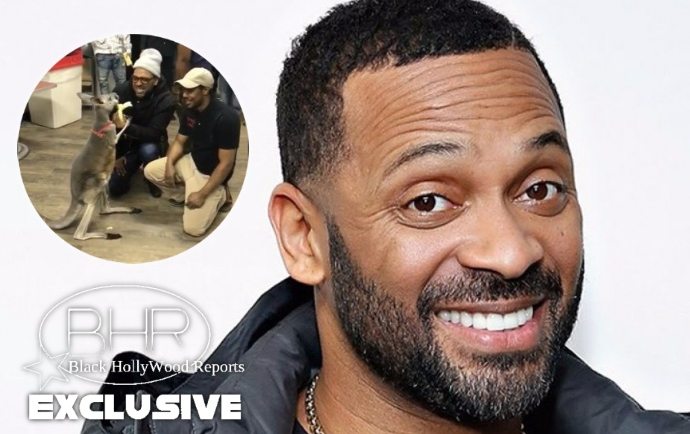 The incident took place during a performance on March 31, when Epps invited exotic animal handler Javon Stacks to appear on stage with the kangaroo. Epps ran off the stage when the kangaroo, which was held upright, appeared to swing its paw at Epps after he tugged at its harness. After the video went viral, Epps received accusations of animal cruelty for his treatment of the kangaroo. He attempted to respond to the backlash with a video of him feeding the kangaroo, which he eventually deleted.